One of the initiatives in the PyeongChang 2018 Winter Olympics is The Dream Programme: an “initiative to introduce winter sports to young people who otherwise would not have the opportunity to experience winter weather and winter sports”. They quote: “The dream programme has also helped foster closer ties among nations and enriched the participants through cultural exchange”. But it is hard to believe that young people from other countries would wish for such an ‘exchange’, knowing of the general ‘acceptance’ by the Korean people of the horrendous cruelty involved in the dog and cat meat trades. We don’t want the dream of these young people turning into a nightmare, so please tell the PyeongChang 2018 Dream Programme that the best way to keep the dream alive is to end the dog and cat meat trades. Please let them know this. Click HERE to post your message on their page. Please stop the dream becoming a nightmare for these young people in your Programme by permanently ending the dog and cat meat trades now – before the PyeongChang 2018 event takes place. These atrocities must stop. Young people need to be shown examples of hope, love, and compassion. Not evil, barbaric cruelty. Please make this possible for them. We need to show the world that this is not acceptable . This barbaric inhumane practice has no place in this day and age. End the dog and cat meat trade now. 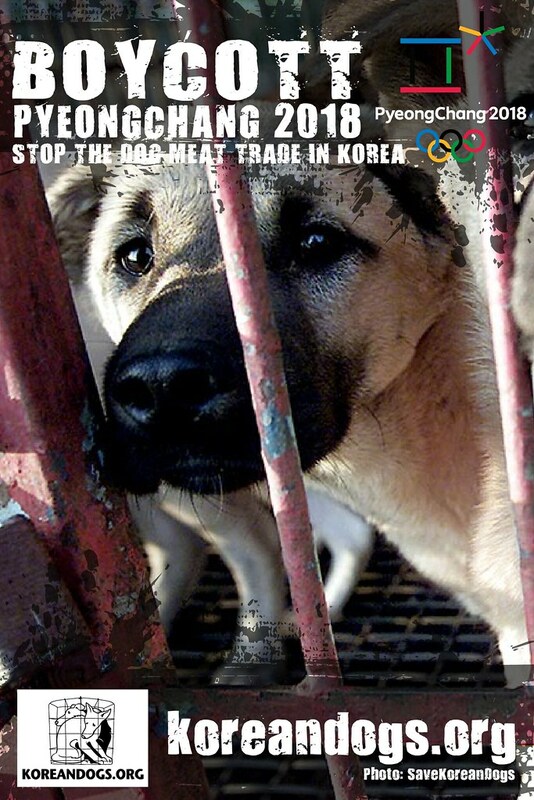 Boycott South Korea’s products and the 2018 Winter Olympics until the hypocrisy ends with the shutdown of every dog meat restaurant, factory, market, construction site, farm !…….This is not worthy of a first world country! I will boycott anything South Korean untill this ends. I’m selling my Huyandai and trading in my Samsung for an Apple. Put and end the dog and cat meat trade, only barbarians would condone it. You promote a dream within the young – what kind of lie are you promoting by taking away the dream of innocent lives by condoning the dog/cat meat trade. A country is judged by the way it treats its animals. I’m so ashamed to know this exists in your country. If you treat your animals, this way, I’m afraid to know how you treat your woman and children. Please make this stop. No living creature deserves to be beaten boiled alive and tortured for your appetite. THERE ARE 2 THINGS YOU CAN NEVER GET AWAY FROM! GOD AND KARMA! The Only Logical and Moral response is VEGANISM. Stop cruelty against our pets! ES HORROSO Y SADICO LO QUE HACEN CON LOS PERROS Y GATOS,BASTA YA!!!!!! !EL CALOR NO SE LES VA A IR MATANDO Y COMIENDO CARNE DE NUESTROS ANIMALITOS SIN VOZ!! !DEJEN DE SER IGNORANTES Y CANIBALES!!!! !STOPPPPPPPPPPPPP NOWWWWWWWWWWWWWWW!!!!!!!!!!!!!!!!!!!! Let’s work together to stop this inexcusable practice. Non mi do una spiegazione a tutto questo male…luridi bastardi…basta con queste atrocità e rinsavite, civilizzatevi e diventate umani anche voi!!! KEEP UP YOUR GREAT & NOBLE WORK == UNTIL EACH & EVERY DOG/CAT FARM IS CLOSED, KEEP AT IT — BE AT THEIR HEELS — NEVER GIVE THEM PEACE UNTIL ALL ANIMALS HAVE BEEN RESCUED & THESE CRUEL & SADISTIC FARMS SHUT DOWN PERMANENTLY! Please end the dog and cat meat trade.